J C Ryle (1816-1900) was a faithful evangelical Christian, a prolific writer and bishop of Liverpool. His books Holiness and Practical religion have never been out of print.This present book was originally entitled The Christian leaders of the Last Century; or England 100 Years Ago (it was published in 1869) and came about as a result of the biographies it includes being written as a series. Ryle's intention in the release of the book was more than recounting lives such as those of George Whitefield, Henry Venn, William Grimshaw and Daniel Rowland and others: he applies the lessons from their stories and appeals for a return to the faith and dedication of these excellent men. This edition it has been lightly modernised and references which would confuse the modern reader have been updated. (Welsh readers will be delighted to know we have corrected Ryle's mistake in referring to Daniel Rowland as `Rowlands'!) Ryle would surely approve: he wrote for the ordinary reader of his day. The biographies remain as gripping and inspiring as they came from his pen. 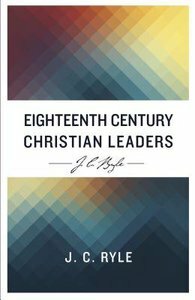 About "Eigthteenth Century Christian Leaders"
R C Ryle (1816-1900) was appointed as the first Bishop of Liverpool in 1880 and was the leader of the Evangelical wing of the Church of England for more than half a century. His written works have remained in demand for well over a century, being highly valued for their clear and lively style. Ryle wrote on a wide range of themes, and his teachings, both practical and spiritual, remain as fresh and relevant today as when he first wrote them down.